I am very excited and grateful for the responses I’ve had to the new double book launch. One MSP sent me a note that he’s “desperate to buy the new edition” of Managed Services in a Month. Several others have also told me how excited they are. Note: Many people have asked about a discount because they just bought one of these books. If you bought one of these books since July 1st, 2017, you can get the new version FREE. If you bought from us, we have a record and will send you the free upgrade. If you bought from Amazon or someone else, and you registered your book at www.smbbooks.com, then we have your info and you will receive the book for free. The official launch starts Monday, November 13th. That’s when I’m officially opening sales for two the new books. I’ve created some bundles to help you fill out your library – and improve your business. The biggest question I’ve been getting is sales/marketing/new clients. Basically, people are challenged with how to get new clients. You want to grow your business but this challenge never goes away. I think the best thing you can do here is to create an offering – a bundle – that separates you from your competition. As clients face questions with cloud services, ransomware, and news headlines full of new technologies they can’t possibly understand, their ability to buy intelligently goes down. As technology grows faster and faster, the percentage of stuff that just sounds like “blah blah blah” to the client goes up faster every year! You need to create bundles that include all – or most – of the technology that clients need. You need to bundle it and market it in a way so that clients feel safe and comfortable and taken care of by your business. That’s why the new books are being delivered with new classes. 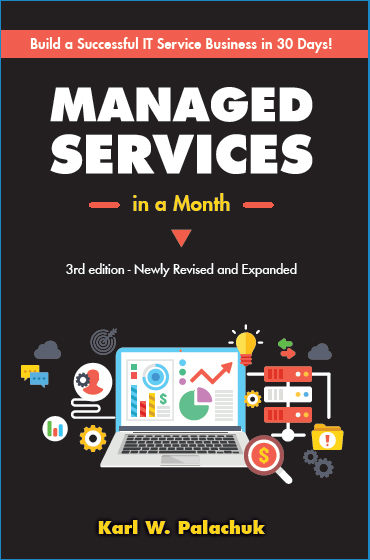 In addition to Managed Services in a Month – 3rd Edition, I’ve completed revamped the popular class “Managed Services in a Month – Applying the Book.” To get the most out of your book, simply take the class. It will be offered several times in 2018. Similarly, in addition to Service Agreements for SMB Consultants – Revised Edition, I created a new class called “Service Agreements for SMB Consultants – Applying the Book.” It will be offered twice next year. These classes give you the opportunity to go through the material in manageable chunks. I give you homework. And if you complete it, I give you feedback. Plus you can arrange an “office hours” time to connect with me by phone and answer even more of your questions. Each class is five weeks long and includes time to ask questions. All classes are recorded. And of course the courses and books all include amazing amounts of downloads, forms, and checklists. So you don’t have to build your system from scratch. 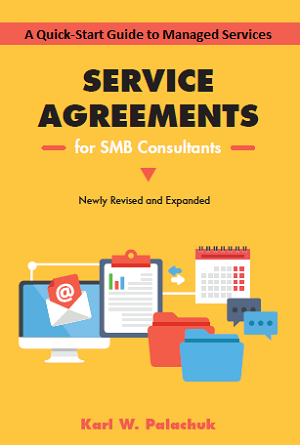 In total, the books plus classes will give you a huge focus on building a new, modern bundle of services – including Cloud Services – that you can take to your clients and prospects. It’s no coincidence that periods of massive focus on education are also periods of growth for your company. You’ll have new offerings, more modern bundles, and you’ll be excited about it. That will make it more appealing to clients as well. Both of these books are pretty inexpensive. In this double book launch, I’m selling as a set for only $59.99. November. We’re releasing ebook versions in December, and the paperbacks will be out in January. I really want you to make changes in your business. You may know that I teach a class called Managed Services in a Month – Applying the Book. I’m throwing that class into the launch as well – at an amazing price.
. . . AND I’ve got an even bigger bundle for people who want to totally transform their business in 2018. That special sale goes live Monday the 13th. So stay tuned for the Go-Live announcement.